A very easy to prepare yet delicious recipe which is a great accompaniment to any type of Indian bread. 1. Wash the spinach leaves, discard any damaged leaves. 2. Bring water to a boil in a cooking vessel, reduce the flame to low. Add the spinach leaves to the simmering water and cook for 2 minutes. 3. Drain the spinach leaves into a colander and immediately pour ice cold water over the leaves. This is called blanching. Keep the leaves aside to cool down a bit. 4. Bring water to a boil in the same cooking vessel, add the sweet corn kernels and boil them until a little tender. Drain the water and keep the sweet corn kernels aside. 5. Gently squeeze the excess water from the spinach leaves and add them to a blender. 6. Add green chillies and grind to a smooth paste without adding any additional water. 7. In the same cooking vessel, heat oil. 8. Add shah zeera and when it starts to turn brown add the chopped onion. 9. Cook till the onion starts to turn translucent. 10. Add the ginger garlic paste and mix well to combine. 11. Add the boiled corn kernels and mix well. 12. Add the spinach and green chilli paste and mix well to combine. 13. Add amchur powder and salt to taste. Add some water if required and cook for about 3 minutes. 14. Add the cream and mix well. Cook till you reach the desired consistency. 15. In a small pan, dry roast the kasoori methi for a few seconds. 16. Add the kasoori methi to the gravy and mix well. Switch off flame. Add the lemon juice and mix well. 17. When ready to serve, add a little cream in the centre and swirl with the spoon. This must be yummy side dish, great recipe! 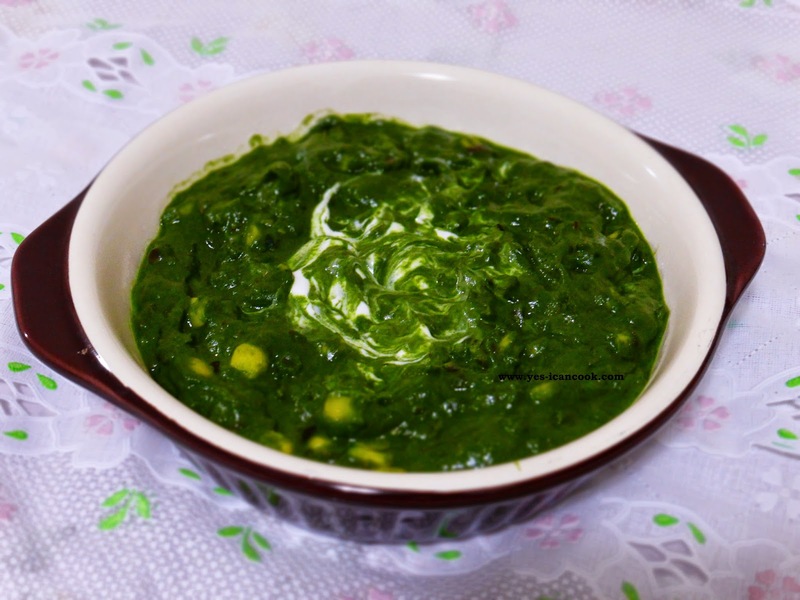 Healthy & new recipe of spinach............love to try.